Forum » Game News » Halloween festival 2018! Halloween is a holiday that goes back to the traditions of the ancient Celts. Despite the fact that the holiday is dedicated to the dead - this holiday brings smiles, parties, masquerades and the joy for kids from full bags of sweets! 1100AD team congratulates all the players on this pumpkin holiday and wishes you all joy and happiness as well as to never forget your ancestors! Fun fact: The name "Halloween" comes from the Scottish abbreviation of the English phrase "All-Hallows-Eve" - "the eve of All Saints Day." In honor of the holiday from 10/30/2018 to 11/15/2018, you will find new products, contests, discounts and hot offers! 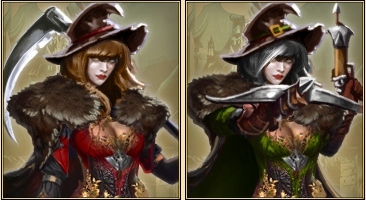 At the time of the celebration in the game, there will be two new soldiers - Baytlin house witches. Two charming sisters Mary and Kali are ready to serve their master and participate in all battles! Charming female warriors can be obtained for a mini-game, purchased or received as a gift. House sisters will serve until the end of December, after which they will automatically be removed. The exact time of the disappearance will be announced later. All heroes received an additional 3 levels to all skills except Intelligence. To raise the level of any skill, you will need a special artifact that can be found in promotions or in rewards for mini-games or created using a recipe in a festive tree. Attention: such skills as logistics and movement will also have a limit - no more than 90% of the initial speed. Great architects came to our lands from distant places and all draft buildings received 2 additional levels. 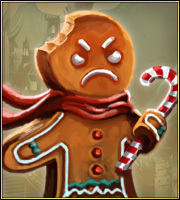 To improve the buildings, you will need drafts that can be found in rewards for mini-games and contests, or created using a recipe in a festive tree. At the time of the holidays in the valley, a new temporary location “Sugar Castle” will appear. Sugar castle has a higher chance of dropping rare items, but be careful - the new defenders of the location are not very friendly and will not give you their treasures without a good fight! In the Skill Tree, there are new levels with skills. Earn points, pump skills and become even stronger! The holiday is about to begin and it`s time to get ready for the festival of the dead! To complete the task, you need to collect special artifacts that can be obtained for research in temporary locations (Wrecked wagon, Military Camp, Fair, Dense Forest, Zhizorsky Castle, Sugar Castle, Aphrodite Temple). Those artifacts must be inserted into suitable slots on the game field. When all parts are in their place, the player receives the indicated reward. The reward list can be shuffled for gold. For each player, statistics are kept about how many costumes were collected. At the end of the holiday, the TOP 10 best players will receive a prize. You can see your place in the TOP statistics. There is also a mid server competition in the Halloween Festival Mini-game! Top 10 best players among all servers that score the most points in a mini-game will receive valuable prizes as well as TOP-5 Orders among all servers will have the opportunity to win +1 point to the Order skill. Take a part in the “Match three” Mini-game! Once in a while, you will receive free moves, and additional moves can be purchased for gold. Statistics are maintained for each player and at the end of the holidays, the TOP 10 best players from each server will receive individual prizes! The rules of the game are very simple: You need to assemble a row or column of 3, 4 or 5 identical elements. Depending on the number of items collected, the player gets points. Obstacles will appear on the playing field in the form of blocks that block elements. You can break the blocks by crossing two striped elements or two bombs, or you can break it with a hammer. The blocks can be strong and one time will not be enough to completely break the block. Collect points and get great prizes! The more games, the more valuable the prizes. Statistics on the number of points are kept for each player and for each Order, and at the end of the holidays TOP 10 best players and TOP 10 best Orders * will receive valuable prizes. Win different items for yourself and extra skill points for the order! Players also have access to TOP, in which the most effective Order will be determined among all the participating Orders. The best 3 Orders for this TOP will receive +1 additional point to the skills of the Order. Additionally, we announce the mid-server contest! Each player who has reached 30 million points among all servers will receive a festive prize set and a bonus city with 20,000 mercenary and population points, and for every next +1 million points the city bonus will be increased by 1,000 points. Additionally, the top 5 Orders for effectiveness, winners in the mid-server competition, will receive special prizes in each category! Note: The final limit in the game for city points is 99 points. Those players who have already reached this limit will also receive prizes used for game levels, but in order to receive a guaranteed prize city, you will need to contact technical support specifying which city you want to replace while retaining all of the bonuses. Keep track of the game statistics and win unique prizes! In all temporary locations a special artifact “The Bowl of Gloom” can be found. For each player, statistics on the number of artifacts found is kept and at the end of the holidays,TOP 10 best players will receive valuable prizes. - 30% for the purchase of items in the store. During the celebration, players will have the opportunity to exchange ancient coins for items through the store. The limit was also increased to 10 for the opportunity to acquire OVL and OVN. We also remind you that the points also have limits: you can have 2500 OVL and 2000 OVN maximum. 1. Fixed graveyard. Now you can donate 15 heroes per week. 2. All locations switched to 11-level mode. This change applies to all servers. 3. Added the ability to see the coordinates of locations in the repository, as well as identify unfinished locations. 4. The principle of activating protection against attacks for already besieged objects has been changed. 5. Added the ability to increase the defense and attack of heroes to 10,000 points. 6. Islagrade, Nanban, Outremer: changed the location capture mode. Now the capture of locations occurs by siege. Other servers can switch to this mode as desired. In order to enable this mode on your server, you must collect confirmation of consent from a minimum of 5 TOP Orders of your server.